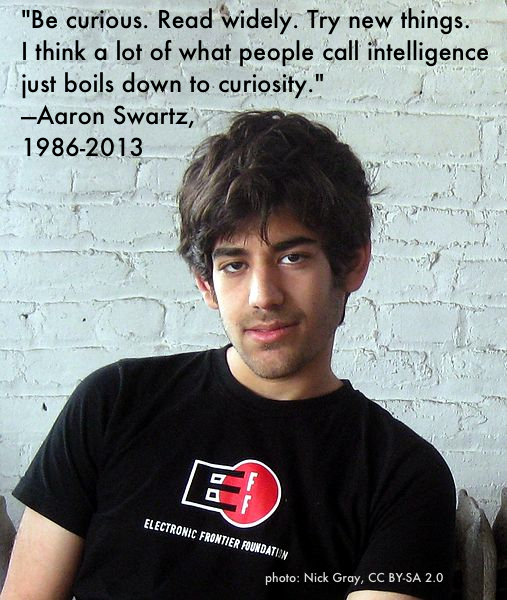 Please join us as we gather to remember Aaron Swartz. Reception at 7:00pm, memorial at 8:00pm. Speakers will include Danny O’Brien, Lisa Rein, Peter Eckersley, Molly Shaffer Van Houweling, Cindy Cohn, Brewster Kahle, Tim O’Reilly, Elliot Peters, Alex Stamos, and Carl Malamud; there will be an opportunity for brief remembrances. Please consider RSVPing so that we know how many people to expect. If you are unable to join us, you can watch a live stream of the event. From Aaron’s friends at: Creative Commons, Electronic Frontier Foundation, Noisebridge, Internet Archive, Wikimedia Foundation, Stanford Center for Internet and Society, O’Reilly and Blurryedge.